During the darkest months, the warmth and glow of a crackling fire is one of life’s most comforting pleasures. There’s barely an evening goes by from October onwards when we don’t light the open fire in our living room, and the room feels so cold and bare without it that we’ll still be laying it well into April. There’s a lot to be said for staying indoors curled up on the sofa in winter, and much of the time that’s what I choose to do - I’ve happily, and wholeheartedly, embraced the culture of hygge. Like most people, we tend to spend a large proportion of our time outdoors as a family during the summer months, but instinctively tend to spend a lot more indoors once the mercury plummets. Winter is perceived as a time for hibernating but it’s something that’s counterintuitive for humans, particularly those of us prone to depression and anxiety. While it’s tempting to stay inside when it’s bitterly cold and nature lies dormant, we all know that getting outside helps banish low moods and energy levels, whatever the weather. Forming a connection with nature is good for our health and wellbeing. There’s a word in Norwegian: jordnær, that roughly translates into English as “nearness to the earth” (it also encompasses embracing your past and where you come from, which is part of the ethos behind “Norway Day”). Norwegians have a strong connection with nature - and for them, eating outside is an extension of that affinity. We have friends close by who have access to a small wood that belongs to the local farmer. One bleak and grey late winter afternoon, we arrange to join them in the hope of creating our own bålkos. We wrap the children up in warm layers, gather stocks of firewood, tools and food supplies and tramp down the plough ridged field behind their house, quietly giddy with the sense of excitement that comes with embarking on a new adventure. The children quickly disappear to gather sticks for kindling while we prepare the food. 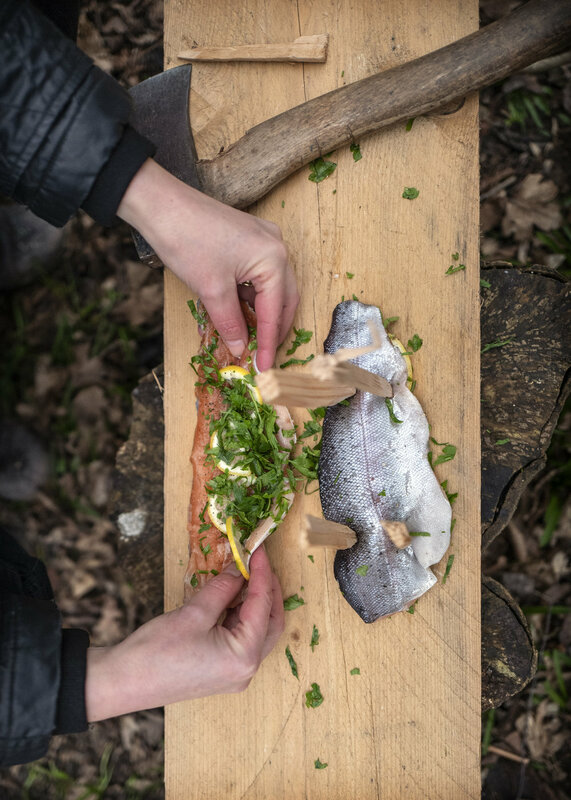 We’re following two time-tested recipes researched by food writer and blogger, Nevada Berg and published in her cookbook, North Wild Kitchen: Cooking from the Heart of Norway: wood plank trout and twisted carrot and oat bread. We season the trout fillets with parsley and slivers of lemon, then sprinkle with salt and pepper. The children return rosy-cheeked and settle in for the task of igniting sparks with strikers to get the fire going. It’s not long before it’s burning fiercely and we’re all captivated by its flickering flames as we attempt to whittle the wooden pegs we’ll need to attach the fish to the planks. Each fillet is then flipped over and fastened to a plank skin side up. Once they’re secured in place, we arrange the planks upright next to the open flames of the fire. Nevada’s recipe tells us they will take at an hour to slowly cook. We weren’t really timing them but my belly began to let me know that more than an hour must surely have past and they weren't showing any obvious signs of being cooked. We manoeuvre them closer, wedging the planks together over the fire in a teepee effect and the skin slowly starts to crisp. The aroma from the smoke and trout fills the air, and it’s difficult not to fall into a trance as you stare into the glowing flames. Slow cooking takes patience - frankly not one my virtues - but we’re in no great hurry. The kids are happily building a bridge from the shallow pond’s “island” and we divert our attention to the baking of the bread and cooking the whole new potatoes in the skillet in the meantime. I cheated a bit and par boiled the potatoes at home, so they just need seasoning and rolling in a few knobs of butter. I’ve pre-made the dough for the twisted carrot and oat bread and we wrap and pat it on to long sticks of elder that we’ve given sharp ends with our whittling knives. The potatoes don’t appear to be doing much in the pan and we decide to wrap them back up in their foil parcel and throw them directly into the embers. We throw some sausages on to the skillet just in case the children are fussy about the fish and the bread. We needn’t have bothered, they all wolf it all down hungrily, sipping on hot chocolate laden with mini marshmallows that we’ve brought in a flask. To stand over an open fire as you breathe in the cool air and gaze up at the trees towering overhead is one of the most pleasant and fulfilling ways to cook. There’s a connection between the process and the finished meal that completely transcends the experience of cooking in a kitchen. I’s difficult to describe how wonderful the food tasted; as though the fire cooking has simply, and sublimely, enhanced their natural flavour of the fish and potatoes. The bread is sweet and earthy. 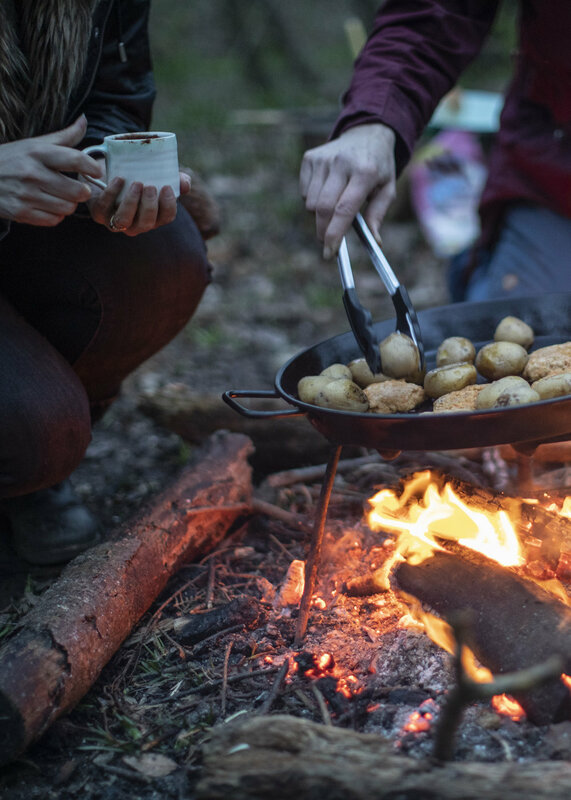 There’s a lesson to be learned in slowing down and enjoying the process of preparing and cooking a meal outdoors and I think, in part, that’s down to the calming effect of spending a quiet afternoon surrounded by trees and nature. As the sun began it’s rapid descent below the tree line, we let the fire burn down. The children spend an age poking it with sticks and for a while we were all transfixed by its glowing embers. Without the warmth of the fire a cold wind begins to bite. It’s dusk when we begin our steep ascent back up the hill and we can just about make out the outline of a large herd of roe deer on the brow of the hill. They stop, suspended in the low mist, and stare at us wide-eyed and curious, before turning, flicking up their heels and disappearing out of sight. It’s the prefect end to a magical afternoon. ** Please note that in England and Wales you must have permission from the landowner before lighting a fire , which covers all land, national parks and forest. Campfires are legal in Scotland but please check the guidelines before you proceed. Always make sure that a fire is properly out before you leave the site by throwing water on it. Add the herbs, lemon and seasoning to the fleshy side of the fish. Drill four holes into each plank, then attach the fish to the planks skin side up with four whittled wooden pegs (you’ll need to whittle them into as sharp a point as you can). Hammer the pegs into the holes (we used an axe head but ideally you would use a mallet). Wedge or prop up the planks beside the fire and cook for approximately one hour. Combine the flours, oats, baking powder and salt in a large bowl. Add the milk, honey and carrots and stir with a wooden spoon. Take a handful of dough and form it into 1/2 inch thick snake shape, then wrap the dough around the top of the stick, leaving enough room at the bottom to safely hold the stick near the fire. Hold the sticks over the embers rather than the flames and cook for approximately 10-5 minutes or until the dough is cooked through. Carefully remove the bread from the sticks and allow to cool slightly before eating. A squeeze of honey ( if you like it sweet, as my children do). Slowly melt the chocolate drops in a bain-marie (a bowl sitting on top of a pan of boiling water). Warm the milk in a pan but don’t let it boil. Once the chocolate has melted add the warmed milk a little at a time until the hot chocolate has your desired consistency. I keep mine quite thick and oozy, but make sure it’s runny enough to pour out of a flask! Add a squeeze of honey to taste (if you like your hot chocolate on the sweet side).